Citywide Ferry by Hornblower is launching the first group of 19 new ferries this summer to service the metro New York area. The project specified the use of full Delta "T" Systems machinery room ventilation packages, and Delta "T" Systems/Dinak engine and generator exhausts. 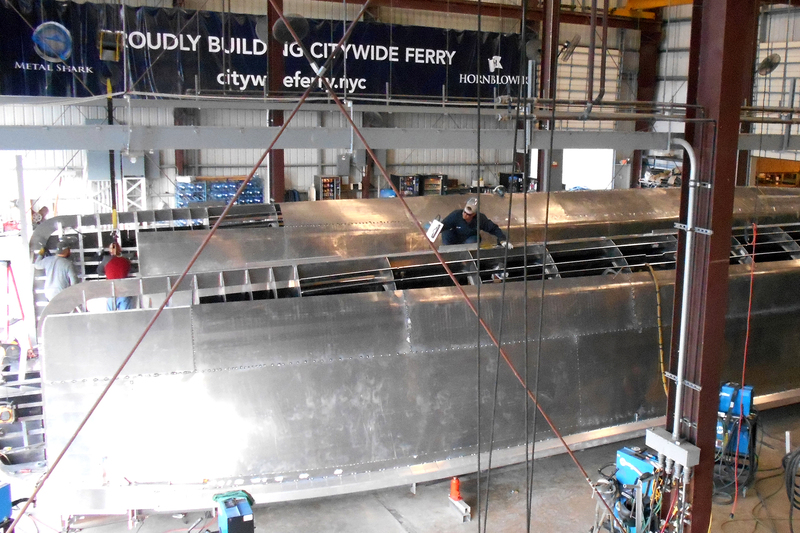 Due to a tight timeline, the Incat Crowther-designed 150-passenger vessels are being built by two ship yards, Bayou La Batre, Alabama-based Horizon Shipbuilding and Metal Shark of Franklin, Louisiana. All 19 vessels will be identical. Delta "T" Systems engineers conducted a full project analysis. In consultation with the builders, Hornblower selected the company's Premium Axial Fans, aluminum Moisture Eliminators, C2 touchscreen Fan Control Systems and its new A-60 Slimline Fire Dampers. The complete ventilation package ensures optimal machinery air flow for the extended service ferries. The vessels are also fitted with innovative modular Delta "T" Systems/Dinak exhausts. The engines took DN250mm ID/350mm OD ducting with 10" residential-grade Miratech 304 stainless steel silencers with 2" insulation blankets. The generators were outfitted with DN100mm ID/200mm OD ducts and 4" Miratech silencers. Unlike traditional welded carbon steel schedule 40 pipe, the new stainless steel Delta "T" Systems/Dinak system weighs 75% less and installs in roughly half the time—an important factor with the tight deadline set by Hornblower. "This is an exciting new chapter in New York City's maritime heritage," said Lynn Oien, Delta "T" Systems president. "We're proud that our products will be part of the new fleet of ferries." Citywide Ferry by Hornblower provides residents and visitors an affordable way to travel in New York City. Six routes covering over 60 miles are planned with completion scheduled for summer 2018. Its website is www.citywideferry.nyc. Delta "T" Systems engineers and manufactures complete marine engine room ventilation systems. The company produces axial fans, blowers, duct fans, controls, dampers, moisture eliminators, weather closures, vents, louvers and grills. In 2016, it partnered with Dinak to offer the innovative exhaust systems through its extensive sales channels. Contact Delta "T" Systems, 858 W 13th Ct., Riviera Beach, FL 33404.561-204-1500; Fax: 561-848-1611. info@deltatsystems.com; www.deltatsystems.com.